Why a Globe? Studies show that, taking the same test, college seniors of today know less about the Earth and geography than did high school seniors 50 years ago. Further, the study of history can’t be fully understood without knowing geography. What students do know primarily comes from flat maps. 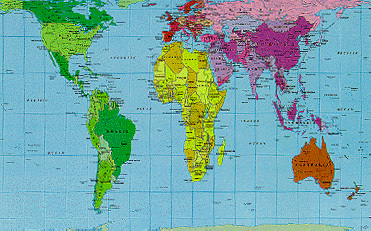 Flat maps distort perception of the earth. Only globes can accurately present undistorted geographic information. Today’s 12″ globes are very accurate and can be excellent learning tools. 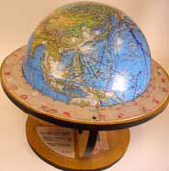 Globe stands however just spin the globe and restrict usefulness. A relief globe with very accurate subsea surface features is the most informative. We have selected the two best relief globes from Replogle, Inc and the G.F. Cram Company, but removed the restrictive metal meridian stands. Why not Flat Maps? Flat maps of large regions necessarily distort the world and this distorted view alters our perception. Fig. 1 shows a typical Mercator projection world flat map. Fig. 2 shows the Peters Map projection, which is a flat map that more accurately portrays size and location relations. Most of us learned on a map like the Mercator projection. Compare the sizes of Mexico, India, Africa, and Greenland. Surprised at the distortions? For more information on these differences go to the www.petersmap.com site. 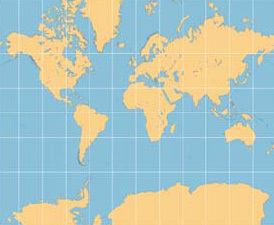 For flat maps, the Peters Map gives the best perspective to students as to size and to travelers the perspective of distance far better than Mercator type projections. A Globe takes away all distortions to give perfect accuracy. Accuracy requires a globe, no flat map will do. Earth Features. The world is a near perfect sphere but it is slightly larger in radius at the equator (3963 mi.) than at the poles (3950 mi.) by 13 miles. The equatorial diameter is twice the radius at 7926 miles and the equatorial circumference is 24,902 miles. A 12″ globe with a 6″ radius is used as a standard and we can then compare it to other meaningful statistics. The Earth has been called Pear Shaped and an Oblate Spheroid indicating it is not perfectly spherical. To regain perspective we will compare Earth features to the thickness of standard copy paper. The thickness of a common sheet of paper would represent a thickness of 2.54 miles or 13,411 feet on a 12″ globe. The radius difference between the equator and the poles is then 5.1 sheets (13 mi ÷2.54mi = 5.1) of standard copy paper. Not much. While we are much taken by mountains and oceans they are less significant in size than one would think. Mt. Everest, the world’s highest mountain at 29,035 feet, would be 2.2 sheets of paper thickness above the globe surface. The Marianna’s trench, the world’s deepest under ocean depth, at 35,838 feet would be 2.67 sheets (35,838 ft. ÷ 13,411 ft. = 2.67) of paper below the globe surface. We sent two men down to the trench bottom in the Trieste deep diver in 1960 and that’s the deepest man has gone below the surface. The average ocean depth is 13,100 feet or only 1 sheet of paper thickness. The big deep oceans are really just about as deep as the thin surface printed paper on this globe. The land surface of the earth makes up ~30% and water ~ 70% (symbol “~” means “about”). So we live on a nearly spherical planet that’s very smooth and we haven’t explored much of it except the surface. The ocean bottom surfaces, not just the continental land surfaces are important in understanding the earth. A circle is divided by a compass into a standard of 360° (Symbol “º” means “degree”). It Notice that the exact opposite point on the circle is always 180° away from any other point. If a position is marked on the globe it’s exact opposite point will be on a Great Circle (explained later) 180° away and called the antipode. This will be useful in plotting important locations. It can be stated that the three most important Earth reference points would be the equator and the true north and true south poles. True North and true South Poles refer to the spinning axis of the Earth and are very different from the magnetic poles, but many people think they are the same. The equator is a Great Circle (GC). A great circle is a line around a sphere, which is the largest possible circumference and would cut through the exact center of the earth if you draw an imaginary plane. Latitude designates locations by degrees north and south of the Equator. Only the Equator is a Great Circle in Latitude and is designated 000°. 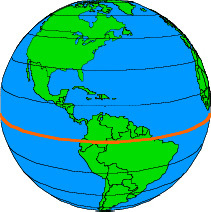 All other latitude lines are small circles and are drawn parallel to the equator. 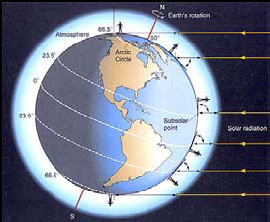 Usually latitude is marked on the globe every 15° north and south of the Equator going up to 90° at the poles. Longitude location starting point is a man-made decision. 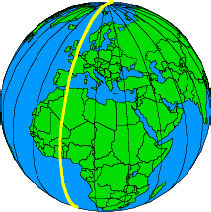 Today the 000° point is through Greenwich, England (marked in yellow) because that was decided upon. 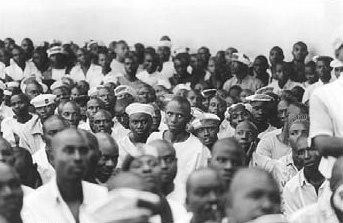 It could have been set at Cairo Egypt or other areas as were proposed but not selected. All lines of Longitude connect to the true North and South poles, and are all Great Circles, and are called meridians. Any points north or south of the equator — on the same longitude meridian — will have the same longitude. The meridian of longitude passing through Greenwich is called the Prime Meridian. There is only one such GC line and it becomes an important reference point. Around the globe going east from Greenwich longitude, meridian lines are marked every 10° or 15° (depending on the globe) until they reach 180°, the international dateline. These are degrees East of Greenwich (030° East Longitude would locate Cairo, Egypt). Going the other way (west) from Greenwich the Longitude meridian lines are marked in the same way until they also meet at the 180° mark. Chicago, Ill would be at 087° West Longitude. All 360° of a circle in both Latitude and Longitude are used but are called out differently. Latitude is read 000° at the equator and goes up to 090° at each pole. 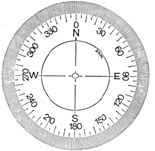 North and South Latitudes are designated as 030° North Latitude, or 063° South Latitude, etc. From England at 000º and going west past the United States we have 180º West Longitude (from Greenwich). Going East from 000º, past Japan, we arrive at 180º East Longitude (from Greenwich). Both East and West meet 180º away in the Pacific at the International Date Line. One degree on the Earth on a Great Circle equals 69.17 miles of distance (24,902 mile circumference ÷ 360° = 69.17 mi.). A minute of distance is 1/60th of that or ~1.15 miles. A second of distance is 1/60th of that or about 101 feet. A complexity comes in when identifying a Longitude position. Notice that the distance between lines of Longitude — which start at the equator — narrow as they get near the poles. Keep this in mind when plotting locations. The distance between Longitude degrees gets smaller near the poles. Distance: Distance is measured as the shortest line between two points. Distance is measured on a Great Circle line. Planes fly a Great Circle. When you walk, you are walking on a Great Circle route. Ships sail Great Circles. On a globe this will be a straight line. 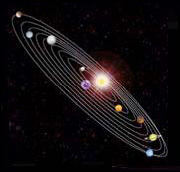 The planets all revolve around the sun in what appears to be a very flat solar system disk or plane. Sometimes the terms rotate and revolve cause confusion. The Earth revolves in an orbit around the sun, and it takes one year. The other planets orbit on this disk also. They all revolve around the sun in the same direction. When the North Pole is facing up in the stand, then the Earth will revolve counterclockwise in its orbit. The Earth advances just about 1 degree per day. As the Earth orbits, it also rotates on its axis. The Earth rotates one complete turn in 24 hours. It will do this 365 times a year to complete its orbit and start again. 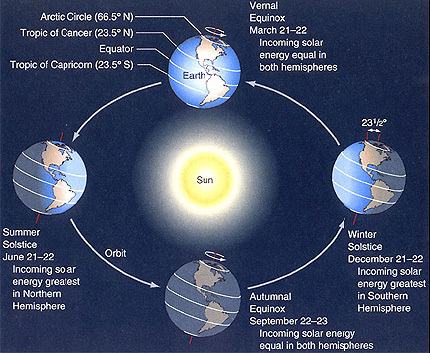 The Earth rotates to the east and again counter-clockwise in our model above. While the earth revolves around the sun it does not spin straight up with its equator parallel to the flat solar system disk. The Earth spins like a top tilted 23.5º to this orbit disk. Now would be a good time to understand some of the inside structure of the Earth. We will use two graphics from NASA that illustrates the commonly accepted size and composition. The Earth has a radius of 3,963 Miles. Most of the volume of the Earth is made up of the Inner and Outer Core and the Mantle. 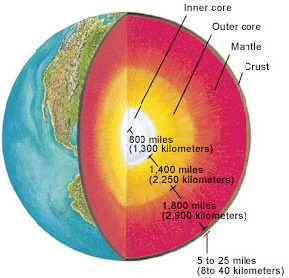 The radius of the Inner Core is ~800 miles and the Outer Core radius is ~1400 miles. That’s a total of 2200 miles of core in radius or a total of about 55% of the full Earth’s radius. The Mantle is ~1800 miles thick. Add those together and you get 4,000 Miles, which is greater than the total. There are some averaging errors but it points to the fact that the crust we live on is extraordinarily thin. The second picture shows that the Continental crust (land above the oceans) is 10- 70 kilometers thick. In miles, that is 6.2 to 43.5 miles thick. Some parts of land have deep roots going down over 100 miles, but that’s not the average. On our 12″ Globe using our paper thickness perspective that would mean the thick land crust we live on would be about 2½ to 17 sheets of paper thick. What about the crust under the oceans? It is not the same as the crust on the Continents. It is made of different material, somewhat heavier, and much younger. While the land crusts are up to 4 Billion years old, the oldest ocean crust age is only ~200 Million years old. That means that ~70 % of the Earth’s surface is very young. It was formed from the lava flowing from the undersea volcanoes in mid-ocean ridges. It is shown to be 5 – 7 kilometers thick, which is 3.1 to 4.3 miles thick. Our sheet of paper perspective says that the land crust under the oceans is from 1 to 1.7 sheets thick. Quite a difference from the continents. 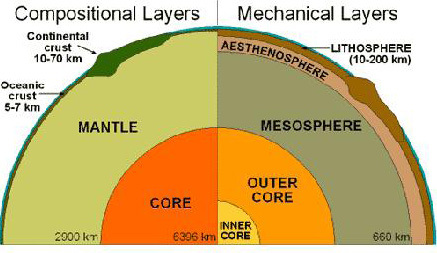 This may help to understand how much of the earth is the core and mantle. These parts are very different from the crust we live on, drilled into and have explored. As discussed, the 12″ globe takes all of the distortions out of a flat map and examples like the thickness of paper add perspective to size issues. Some noted scientists in the alternate physics science groups make a strong case that “logic” and “understanding” have been removed from some important science theories and replaced by mathematics and explanations that just don’t make common sense, nor explain the visible facts. There is some truth to this. The following few measurement examples are meant to put perspective and logic back. Is it? Environmental concerns are serious as is resource allocation. These are not made light of. However, viewing the world from a class room in crowded New York City or Calcutta will have a different perspective than from the empty farmlands of Iowa or Nebraska or the vast emptiness of the world’s oceans. There are currently 6 billion humans on the earth. Population will grow and is expected to level off at about 10 Billion. The US population is about 300 Million. Let’s pack all of these people together for perspective and see what they look like. If we allocate 1 square yard (3 feet on a side) for each person to stand on — together side by side — in a giant square we would need 6 Billion square yards for the world population. With 1,760 yards in a mile there would be room for 3,097,600 (1,760 X 1,760) people per square mile. We would need 1,937 square miles for that standing room earth population. This would yield a square block 44 miles long on a side to include everyone in the world. 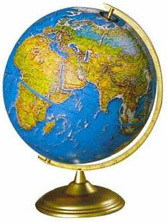 Mileage on your globe is 69.17 miles per degree. So we would need less than 1°. If you draw a square — 1/16″ — per side that would be about 44 mi². ( ■ ) – This image is about the size square you need. The total US population would require a square 10 miles on a side. That would be about this image size – (▪). Mark them somewhere on the 12″ globe. Pretty Small. We now need to build a model of the Solar System using our 12″ Globe. The Earth globe and stand should be placed conveniently in a large room or hallway to also place the moon, but the Sun and Mars must stay outdoors. Place a tennis ball (3.25″ diameter) 30 feet 4 inches away from the Earth globe to be our moon. The moon has a real diameter of 2,160 miles and is 240,000 miles from the Earth. Mars can be represented by a large size softball about 6″ across. The sun is the most important landmark and we will measure from it. The sun will be 2.2 miles away from the earth globe and will be a sphere with a diameter of 110 feet. Try to find an 11 story building nearby to represent the sun. The sun is big and represents over 99% of the mass of the entire solar system. The Sun could hold 1.3 Million Earths. The Earth is less than 1% of the Sun’s diameter. Table 2 shows the vital statistics of the solar system and comparison size and distance to a 12 inch Earth. For a more personal perspective consider driving 25,000 miles per year for 40 years. That would be a total of 1,000,000 miles driven. That would be more than the average in a lifetime. You would go just 126 feet on our model and that would take you to the moon and back twice. If we tried to get to the sun we would get just past 1% of the way. This Solar System is big. We live in an even bigger unit called a Galaxy. Ours is the Milky Way Galaxy and is thought to be spiral in shape like the picture. Our Galaxy is about 100,000 light years across and is believed to have about 200 to perhaps 400 Billion Stars (or solar systems) in it. That would be 200 BILLION Solar Systems like ours, just in one Galaxy! This Milky Way Galaxy is Big. What’s a light year? Light travels 186,000 miles in a second. 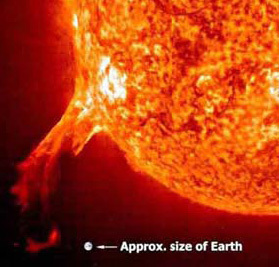 It would take light 8.3 minutes to travel from the sun the 93 Million miles to Earth. In a year, the light would travel one light year. Light travels over 16 Billion miles in a day. In a year that would be 5.8 Trillion Miles, or 5.8 million, million miles, which are terms too big to be meaningful, so it’s called a light year. Our Milky Way Galaxy is about 100,000 light years across. A common sense understanding of the Big Bang Theory can be found in the Articles Section. To read The Big Bang Theory Lacks Common Sense, click here. Only a globe will put land and sea features into visual perspective. 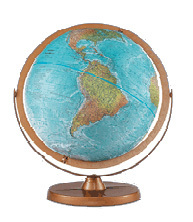 A 12″ globe let’s us put size and depth into consistent perspective by using paper thickness and inches. That same 12″ globe let’s us understand Earth’s movements. We are small. Earth features are also small. Yet, we have barely scratched the surface of our understanding of the Earth. The 12″ globe also builds a model of the solar system that is understandable in size and distances in human terms. The Solar System is huge. Man hasn’t ventured past the moon. Our earliest probes sent out 30 years ago are just now at the edge of this system. The Sun could contain 1.3 million Earths. Nine planets and multiple moons orbit the sun and all are distinctly different. As we learn more about each of them they present unexpected mysteries. We develop our scientific laws based on the facts we know, as we should. But then we assume they all apply to the entire Universe. Perhaps. For perspective, let’s understand the size of the universe. For each of the 6 billion humans on our planet, their “fair share” would be 20 full galaxies apiece, with 100-200 Billion star systems in each one. Four Trillion Solar Systems for each person. They also would get a share of the missing 95% of mass and energy necessary to make the best science theories work. That means 20 times even more than 20 full galaxies. That’s 400 full galaxy equivalents for each human being. I’m thinking we will find new things when we get there. I’m thinking a little humility and open mindedness are called for when it comes to different potential theories. Start with a 12″ globe. Start with an understandable perspective.